Members get a 6 pack or 2 bottles of wine for just $12.95, every day in 2019. That’s our promise and it’s better than any happy hour. From February, members can pick up a take-home six pack of TED, Tooheys New, Hahn Premium Light, Tooheys Old or XXXX Gold at the rock bottom price of just $12.95. If wine’s more your style, that’s covered too. Take home two bottles of Wolf Blass Red Label Sauvignon Blanc or Shiraz for just $12.95. Mix it up if you like and get one Sav Blanc or one Shiraz – the choice is yours. This offer is exclusively for members only. 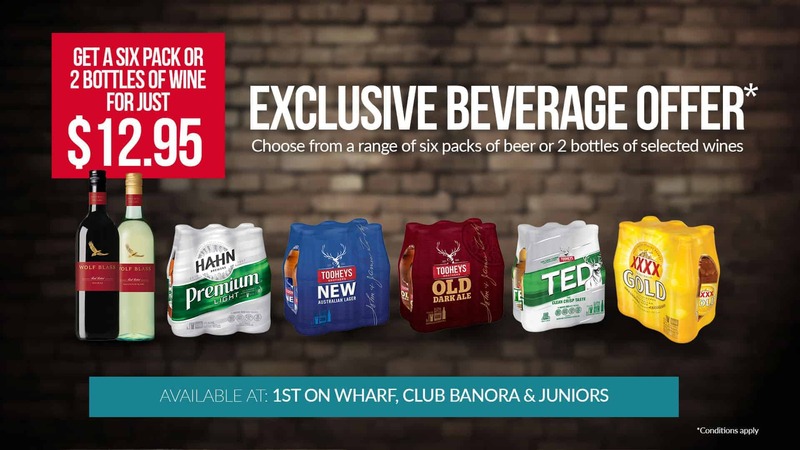 To pick up your take-home six pack or wine special, head straight to the bar at 1st on Wharf (ground level at Twin Towns), Club Banora or Twin Towns Juniors. If you’re not a member, join now and start saving. The cost of your membership, just $16.50, will be covered by just a few purchases. Plus, you will enjoy all the benefits of Twin Towns Members Advantage program. Head to www.twintowns.com.au/membership or call into the Membership Desk when you next visit the Club.